Nigeria is suffering from an epidemic that it doesn’t have a vaccine. To date, no known researchers are trying to find a cure, but the outbreak is rampant and unavoidable. Surprisingly, the ailment has a comprehensive Wikipedia page, legitimizing it as an acknowledged phenomenon. 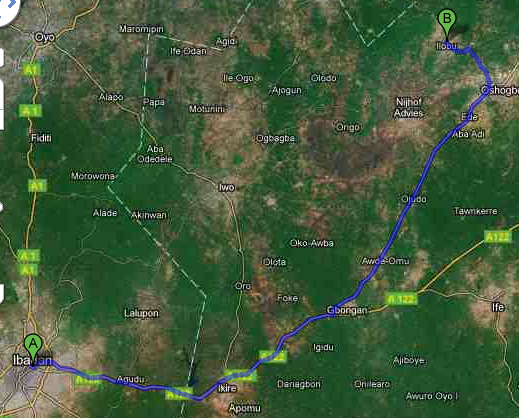 The case is known as African Time or more specifically, Nigerian Time. No one has reported any deaths resulting directly from African Time, but thousands of people report headaches, delays, missed opportunities and schedule changes daily. African Time is the tendency to a relaxed, indifferent attitude towards time and starting events or arriving at meetings/classes/parties at their scheduled times. It is the acceptance that nothing will start at the absolute time indicated on the schedule. It is holding a University class for 10 a.m. and the professor repeatedly showing up at 10:15. It is going to see a play at the theater that says 7 p.m. on the ticket, and characters take the stage at 7:30. You will never see an event in Nigeria that starts at 9:15 or 5:45, none of those odd number times. Events are scheduled on the hour because it is simply understood that the chance of people arriving exactly 15 minutes past nine is miniscule. People indicate start times on posters or invitations a full hour before they intend to really start anticipating people will be that late. You frequently see “6 p.m. prompt” on invitations- a valiant effort to curb the tardiness. Ironically, Nigerians love watches. Boys are always walking through traffic selling sleek knock-off watches, but apparently the time pieces don’t serve such a practical purpose. Not every institution or person runs on this leisurely clock, but it is clearly visible everyday and sometimes inevitable because of society here. Africans are not always to blame for showing up 30 minutes late to the group meeting. Sometimes there are good excuses out of a person’s control: public transportation is one of them. The chaotic route of mini-busses (danfos) and motorbikes (okadas) that constitutes public transportation does not operate on a schedule. You cannot go to http://www.Danfo.com and see a to-the-minute schedule of when a certain danfo will be arriving at a given bus stop. You go to the bus stop, or the side of the road and wait until you see one of those dilapidated white busses zip by. (For the speed racer way the bus, taxi and okada drivers drive you should think Nigerians would be on time for everything. One of the ironies of African Time.) Traffic poses another problem. Unexpected stand still traffic jams caused by trucks that break down in the middle of the road are frequent. I have learned that the term ETA (Estimated Time of Arrival) does not work here because anything could happen on the way and we don’t have the luxury of continual traffic updates to keep us privy to road blocks. Then there is the problem of constantly losing electricity that puts a damper on plans overall. In the U.S. and many other countries, we live our lives by the hands on the clock. They tell us when we are busy and when we are free, when we need to be somewhere and when we can leave. In Nigeria, time adapts to the situation. If Yoruba class is scheduled for 3 p.m. and there is a massive rain fall at 2:50 p.m., you can be sure no students will show up on time. The tricky thing about African Time is you know it will be late, but you don’t know exactly how late. 10 minutes? 20? 40? It can be a very problematic guessing game sometimes. The U.S. has it’s mini-version of African Time, we call it being “fashionably late,” but it applies strictly to parties. It’s common knowledge that it is not cool to be the first one at a party. But if you showed up to a meeting at your workplace 20 minutes after it stared and said, “I am just running fashionably late,” your co-workers would look at you like a crazy person. In Nigeria, if you arrive at the meeting 20 minutes after the scheduled start time, it is likely it still won’t have started. Note taking: Nigeria vs the U.S.
My english teacher lecturing about Amos Tutuola's The Palm Wine Drinkard for English 444–African Prose Fiction. I was sitting in English lecture the other day, looking around the room, taking in the entire scene. Students sitting more or less attentively in chipping wooden swivel seats propped up by long, thin wooden tables. Students in sorts of different outfits, some in native ankara fabrics, most in jeans and fancy tops with matching earrings and shoes. 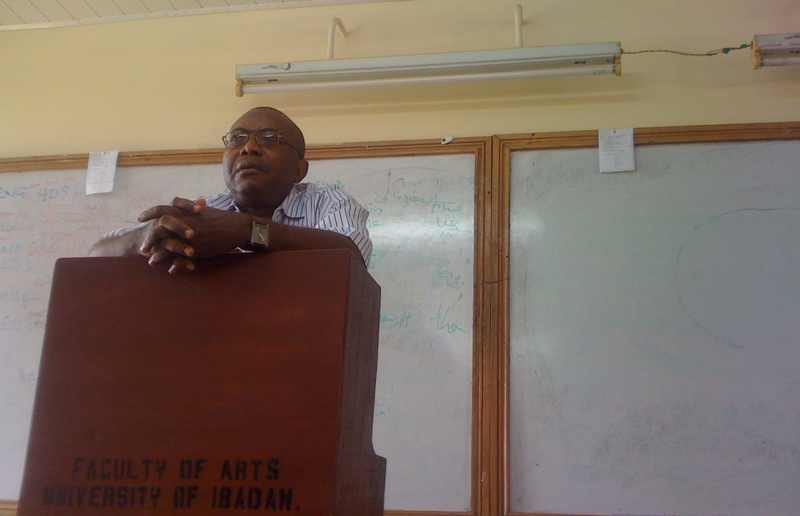 My English teacher’s usual slow and deliberate pace of explaining our topic of discussion, The Palm Wine Drinkard. I shifted my seat on the wooden bench, noticing beads of sweat forming on my forehead, wishing for a breeze to rustle through the open glass windows. I noticed that one thing separated me from the rest of the students. No, it was not skin color. It was our notebooks. The notebooks had minor differences in the size, shape and line height, but the contents was what starkly differentiated mine from theirs. My page had a couple inches of white space on the left, a column of bullet points, roman numerals, letters, stars, what have you, and words filled the rest. Lines had different indents and some important words were underlined. My Nigerian mates had no white space on the left and no bullet points. 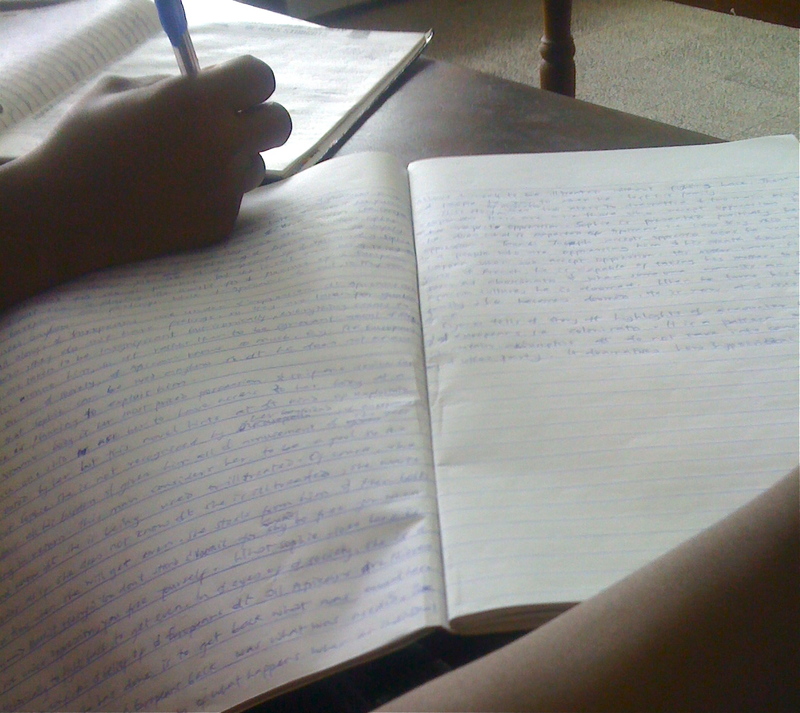 Their notebooks were filled with paragraph after paragraph of full sentences that created an essay. I noticed that the students crammed on each side of me were writing down every word the professor said almost verbatim–well the important sentences anyway– instead of rephrasing it in their own words in shorter form. My mate's notebook in English class. Filled with pages of paragraphs of notes, very different from how I take notes in the U.S. I asked my friend in my Development Communication class if she learned to take notes by writing down everything the lecturer said. She said the fact is they did not learn to take notes like that but people use that method because of the essay based test format. Also, the lecturer might be dictating directly from his notes, and in that case the students want to get as much information as possible. Also, reading supplements for classes can be difficult or impossible to find sometimes. Many of the books I’m reading in English class-African prose fiction-are not sold at the UI bookstore so it is sometimes in the students’ best interest to capture as many of the professor’s exact words as they can. Sometimes I feel like a slacker with my bulleted lists and roman numerals. Should I be writing three page essays like my peers every class? Nah, I think I’d rather save ink and prevent severe hand aches. If you were wondering if people celebrate Valentine’s Day in Nigeria, the answer is, oh yes, they most definitely do. February 14th, the day for lovers, is absolutely crazy in Nigeria, Lagos in particular. Entire streets, hotels, stores, restaurants are covered in red, pink and white streamers, with big heart shaped signs wishing passer bys a Happy Valentines Day. Fancy and fast food restaurants are filled with couples eating out for the holiday. Ibadan, a city which usually gets sleepy around 8:30 p.m., was bustling with cars and people out tonight. I went to Lagos this weekend to relax and get out of Ibadan for a bit and all of my friends there warned me to leave before noon today because the traffic would be horrendous – one of the worst days for traffic the entire year. Many couples spend their nights in the car trying to get to the Island across the Third Mainland Bridge. Boys even walk around in traffic selling heart-shaped Valentine’s Day cakes wrapped in red cellophane for those who are so unlucky. Valentine’s Day in the U.S. is all about chocolates and roses. Any woman would be satisfied and happy to receive those items from her man. In Nigeria, a woman would just laugh if her partner showed up with a bouquet of flowers or a box of chocolates. These gifts are not valued as anything special here and the man who makes the mistake will surely suffer the wrath of an angry girlfriend on Valentine’s Day. Suitable Vals (people shorten the holiday to Vals here) gifts in Nigeria are the three C’s: cakes, cell phones and cars. Nigerian’s take cake baking to another level, especially for Vals. Heart shaped molds with perfectly smoothed fondant icing, covered with red and pink piping, maybe even a personalized message on top. Cake baking deserves a post all to itself so I won’t go too much into it now. Vals cakes are a serious matter and a really popular gift for girlfriends and boyfriends to give. Cell phones, like I’ve mentioned in a previous post, are an extremely important gadget to Nigerians. Everybody wants Blackberrys or Nokias and girls who receive them as Vals gifts will be extremely excited. Obviously cars are the creme de la creme of Valentine’s Day gifts no matter where you are. Enough said. Seeing how much fervor went into Nigeria’s Christmas celebration I was just mildly surprised to see the Valentine’s Day frenzy take over Ibadan and Lagos. 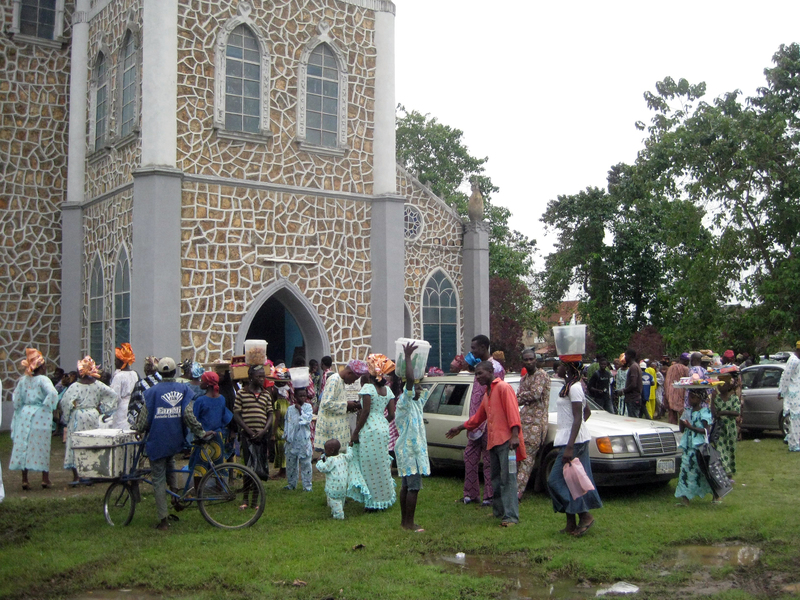 Valentine’s Day plays no part in Yoruba, Igbo or Hausa culture but the younger Nigerian generation values this holiday named after Saint Valentine, one of the Christian martyrs, with great anticipation and delight. Hopefully I will get to hear girls’ gossop and try some of their Vals cakes tomorrow since Nigeria declared a public holiday to observe Prophet Mohammed’s birthday. I was sitting on a bench mindlessly swatting flies away from my feet, waiting. I had already greeted all the people in the area and was just observing at this point, waiting for the tailor to finish sewing a dress. A mother was seated on the concrete porch leaning against the pillar eating and feeding her son. She took a piece of meat from the bowl and handed it to her son. He couldn’t have been more than 2 years old. He extended his little arm to grab the beef. His mom swatted it away but still held the meat in her hand for him to take. He reached again, again she swatted. Why can’t he take the meat? She grabbed his right arm and plopped the meat in his palm. Ooooh, he tried to take it with his left hand. Bad boy. Yorubas have a complex about the left hand, owó osì. They believe it is the dirty hand used for dirty jobs like wiping after easing yourself. If you give someone a present with your left hand, especially an old person, he or she will give you an evil glare and refuse the gift. Accepting things with your left hand is taboo too. Always shake with your right hand. 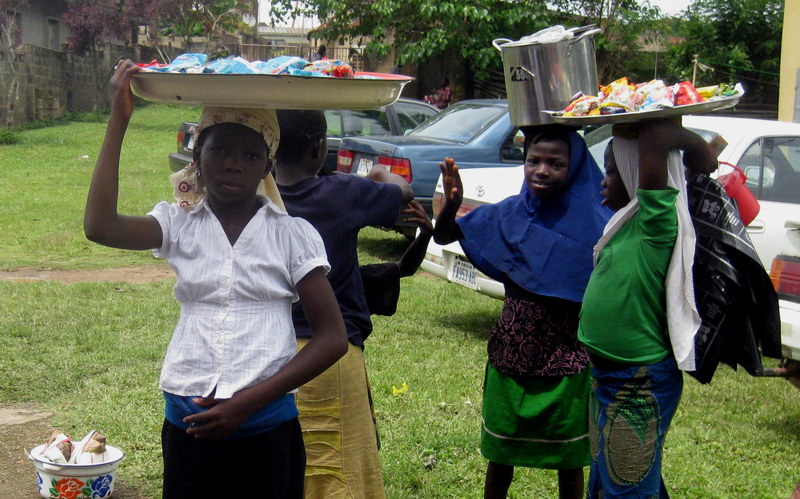 Yorubas have respect for the right hand as the hand you eat with and do other important jobs. The left hand gets no respect. Two of the students on our program are lefties and eating in public always brings many questions. This is not to say all Yorubas are right handed. Lefties exist, but they are not too common. 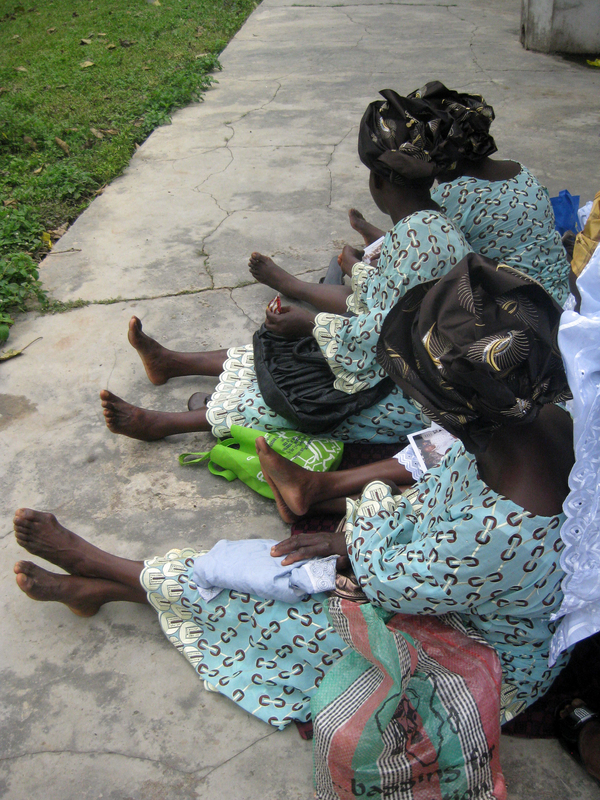 In an effort to revive the use of the left hand and improve its reputation, Yorubas call it owó aláàfià, which means hand of peace. For the record, I am a righty. 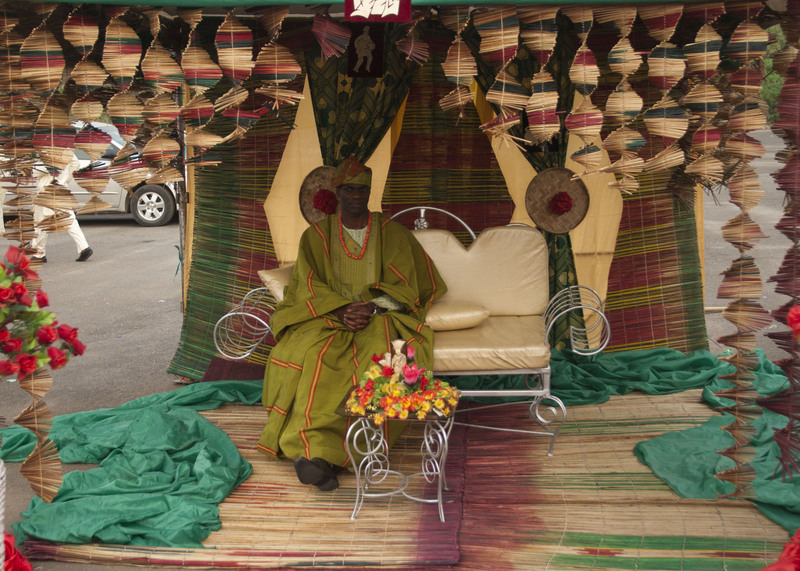 Nigerians–particularly Yorubas–love to celebrate. Birthdays, anniversaries, weddings, naming ceremonies, funerals are all occasions for huge parties complete with plenty of food, deafening music, matching decorations that extend to the smallest details and all sorts of fanfare. 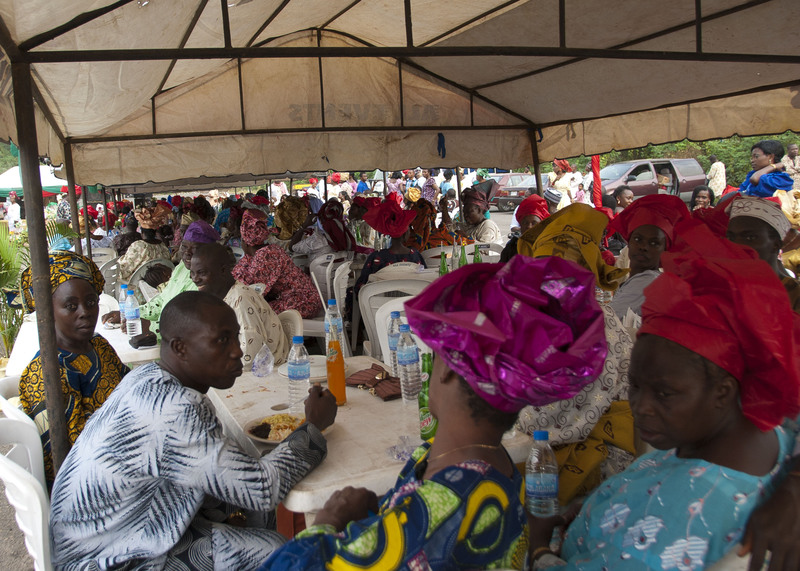 An intimate dinner or cocktail party among friends doesn’t align with Nigerian culture. The bigger the better for the Nigerian party. Lucky for the sociable type these parties happen often, maybe too often. 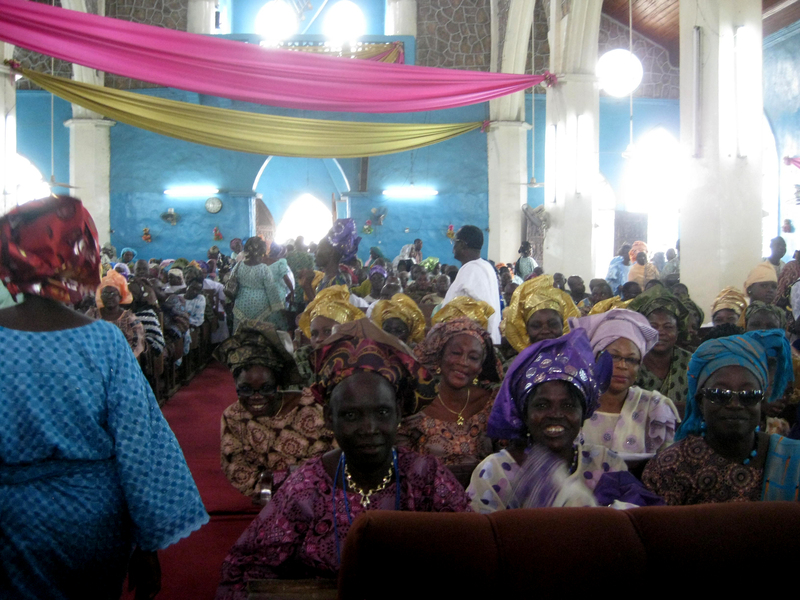 The average Nigerian adult has attended hundreds of weddings. While each of the aforementioned celebrations have qualities that make it unique, they all share a common order of events. They all start with an opening prayer. The MC then introduces the important guests seated at the high table. Caterers pass out a plethora of drinks (juice, minerals, malt beverages, bottles of wine, beer and everyone gets a bottle of water) and plates of food (usually rice with moinmoin and meat, or iyan egusi, or amala) to each guest. Then the celebrant dances while family and friends spray him or her with money. The celebrant’s friends stand around to pick up the 50, 100, 200, 500 Naira notes that fall by the celebrant’s feet. Then the MC or someone else gives a closing prayer, guests collect their gifts and go home with full stomachs and poorer hearing than they arrived with. 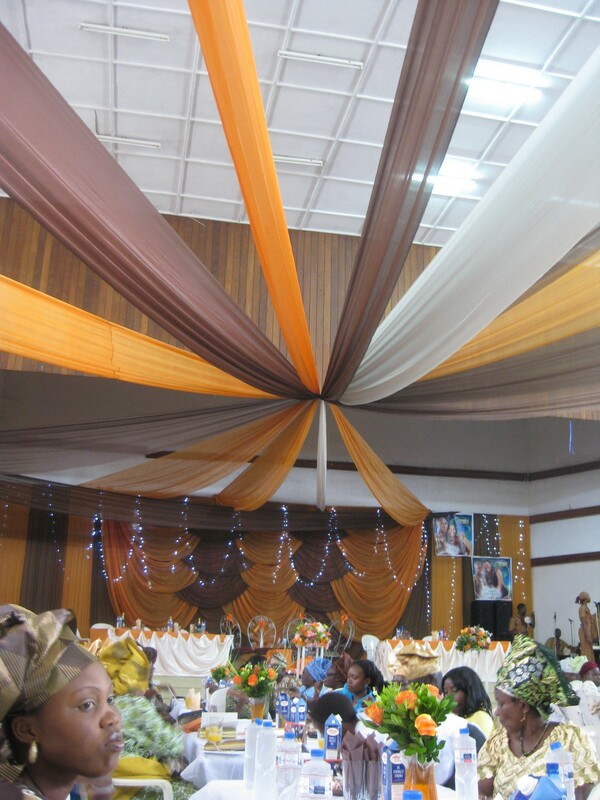 An example of a brown and orange color scheme at a wedding party I attended. Bottles of minerals, boxes of juice abundant on every table. 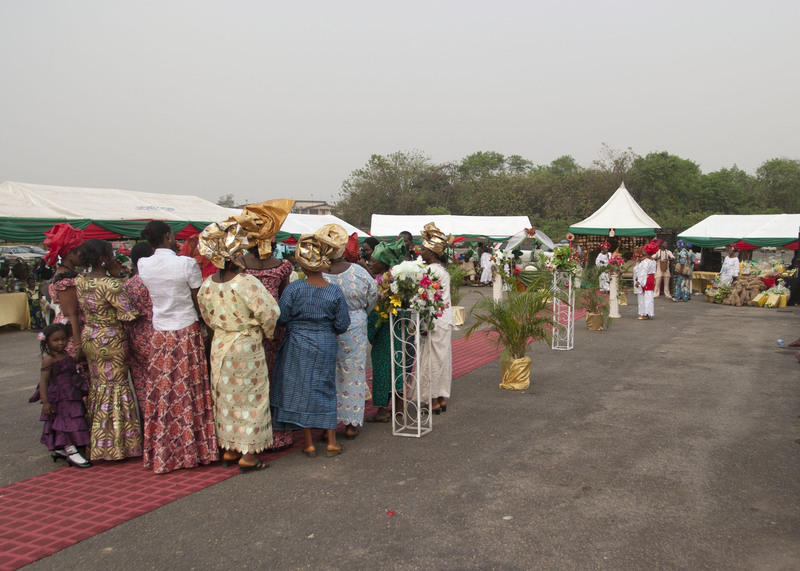 So it went at the traditional Yoruba wedding I attended last weekend. People call this wedding the engagement. The church ceremony followed by a big party is the wedding party. So I celebrated the marriage of Esther and ‘Tosin in the traditional Yoruba style that has been a bit modernized by the imposing presence of microphones and photographers. 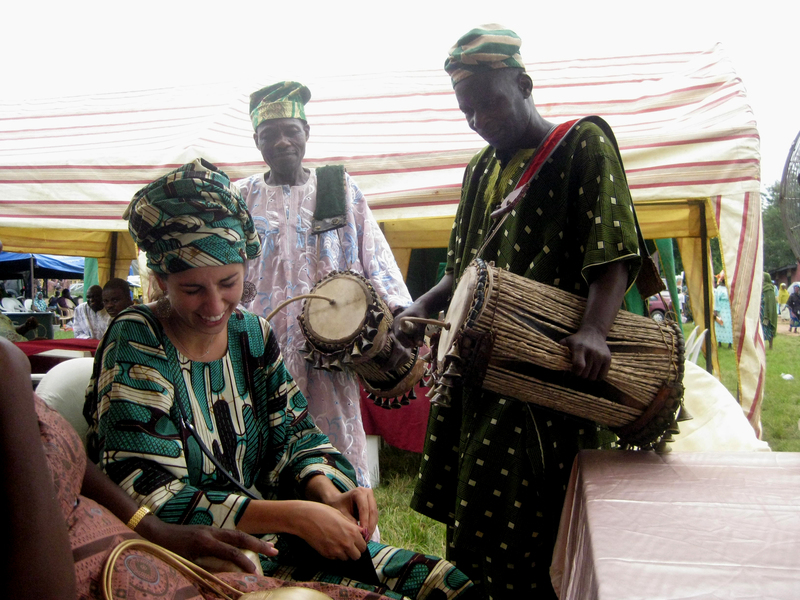 While studying Yorùbá at University of Wisconsin, I happened to choose marriage among the Yoruba as a research paper topic and I am posting the 20-page paper I wrote, all in Yoruba of course, for any Yoruba readers to see if they are interested. I think the wedding will be best described by the photos I took. Guests at the engagement sit under tents out of the hot sun, chatting, eating and drinking. Everyone is dressed in native Yoruba attire, iro, buba and gele around the head for the woman, and buba with sokoto for the man. The guests at the engagement will be fewer than the guests at the wedding party. The bride and her friends walking her down the aisle, singing and dancing the whole time. As the bride walks down the aisle with her friends, the husband sits under the beautifully decorated canopy waiting for his wife to greet him. 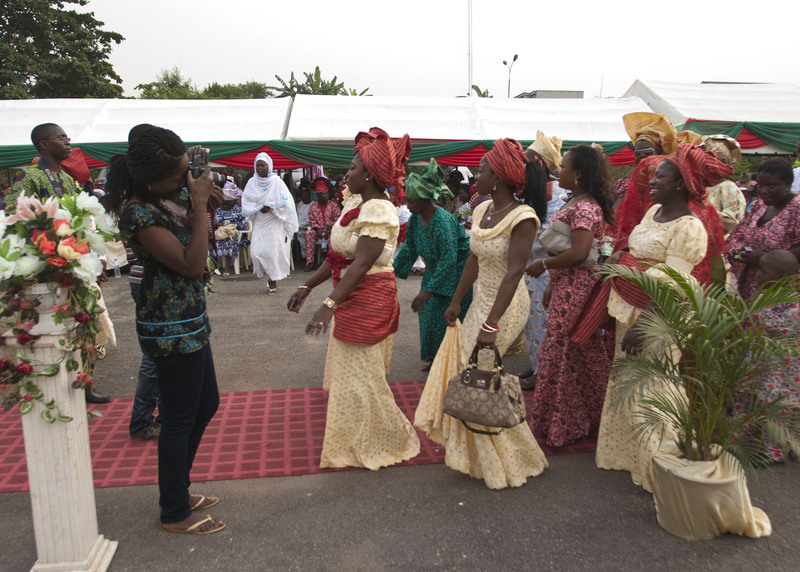 Photographers don't miss any facial expression at Nigerian parties. They are always in the celebrants faces taking way more pictures than needed. Here the bride and her entourage walks her down the aisle. The women dressed in cream and red are in her bridal party. 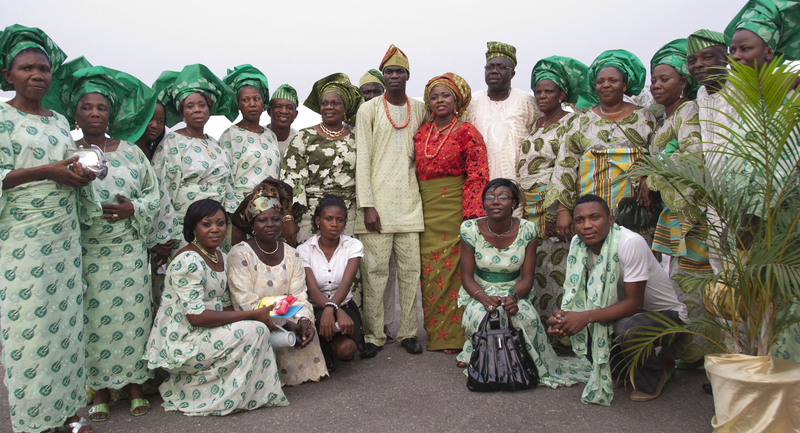 The bride and groom, oko and iyawo, pose with the groom's family. 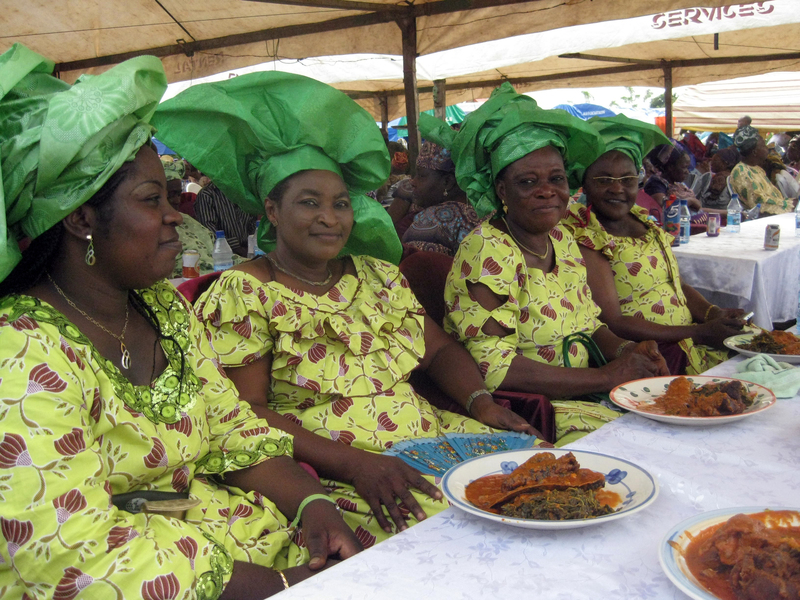 At a Yoruba wedding, everyone in the groom's family wears the same color cloth. The same goes for the bride's family. These colors are different to differentiate the two families that are coming together through marriage. 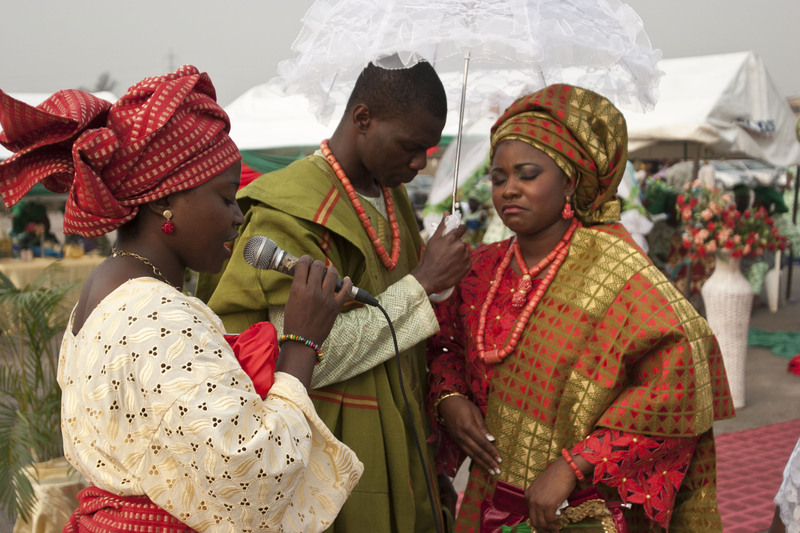 According to Yoruba beliefs, marriage is not just between two people, but two families. 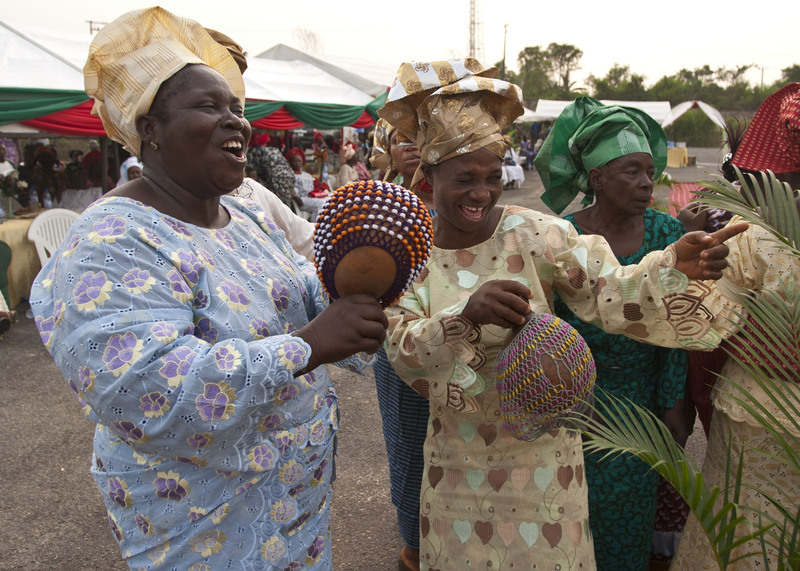 Women playing a traditional Yoruba instrument called the Shekere as the bride dances her way to greet her husband. The dowry displayed for all the guests to see. The groom's family gives the bride and her family many gifts for the marriage. Here we see yams, bananas, other food stuffs and oil. The bride's family is seated on the right. The bride and groom's family sit on opposite sides of the aisle. Esther, the bride, dancing with her new husband, 'Tosin. 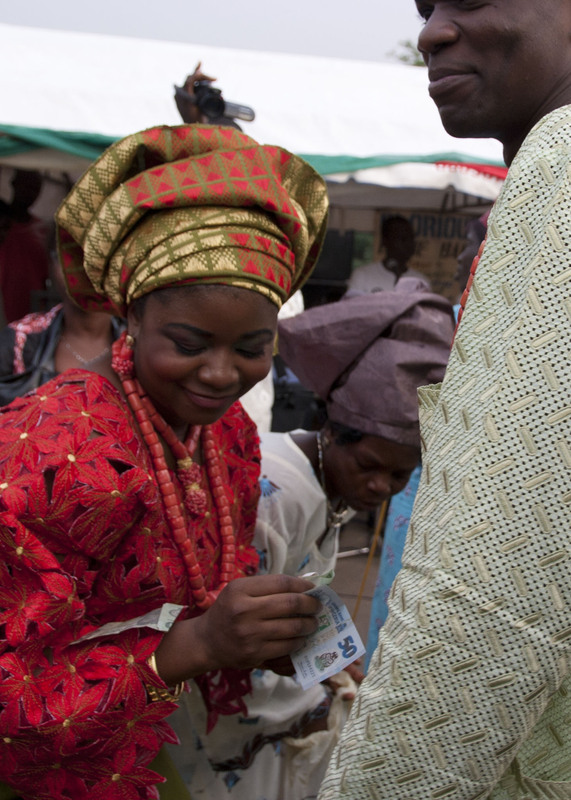 Fifty Naira notes fall in her arms from the Nigerian tradition of spraying money on the celebrants. 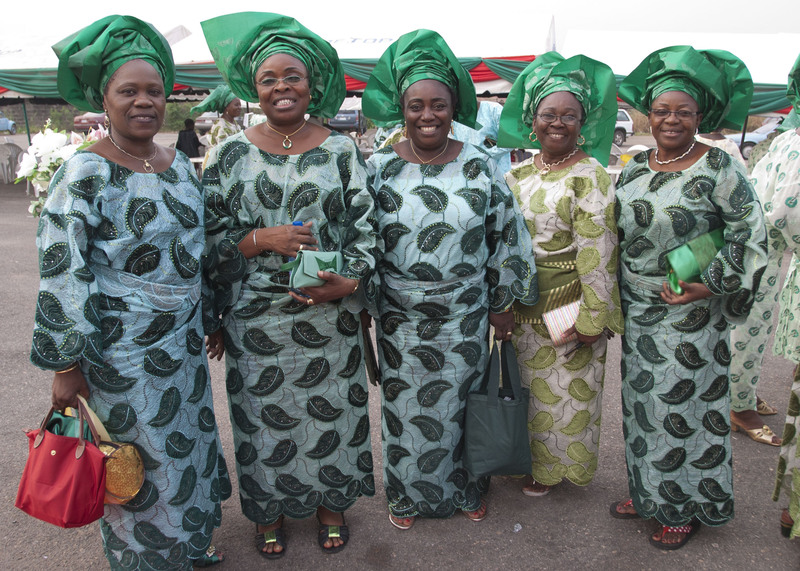 Member's of the groom's party dressed in aso ebi (see earlier post for description). 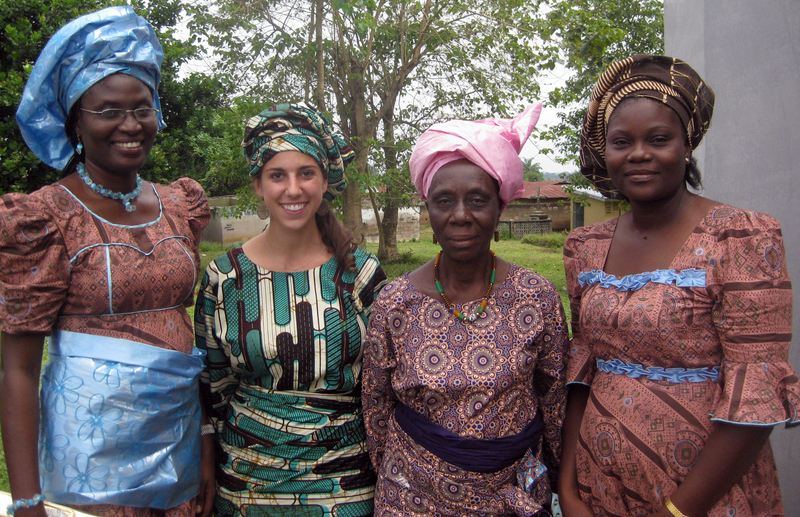 They are wearing a buba (the shirt), iro (the wrapper skirt) and a gele (head wrapper). One of the bride's maids praying for the new couple. Kitchens all across the United States are filled with boiling pots, hot ovens, delicious aromas and anxious cooks hoping the turkey turns out right. The last Thursday in November is the same as any other day in Nigeria. 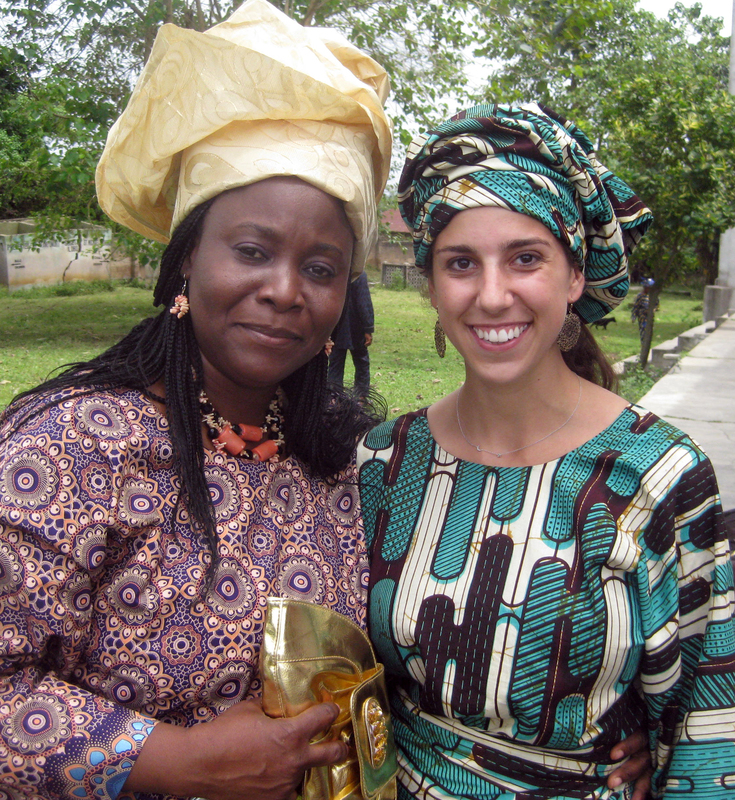 People in America ask me, “do you celebrate Thanksgiving in Nigeria?” The answer is deep. American Thanksgiving involves spending the whole day cooking an outrageous amount of food, eating it with people you love and going around the table saying what you are thankful for. Every minute, every day in Nigeria is thanksgiving. People give thanks for everything, whether it be arriving at home safely, waking up, passing an exam, after eating a meal or taking a danfo ride. They will say “a dupe,” which means “we give thanks.” Nigerians acknowledge activities with thanks that many people don’t think twice about. Then you have the weekly thanksgiving at church. Families celebrate their own thanksgivings, just a special day to give thanks for your family. 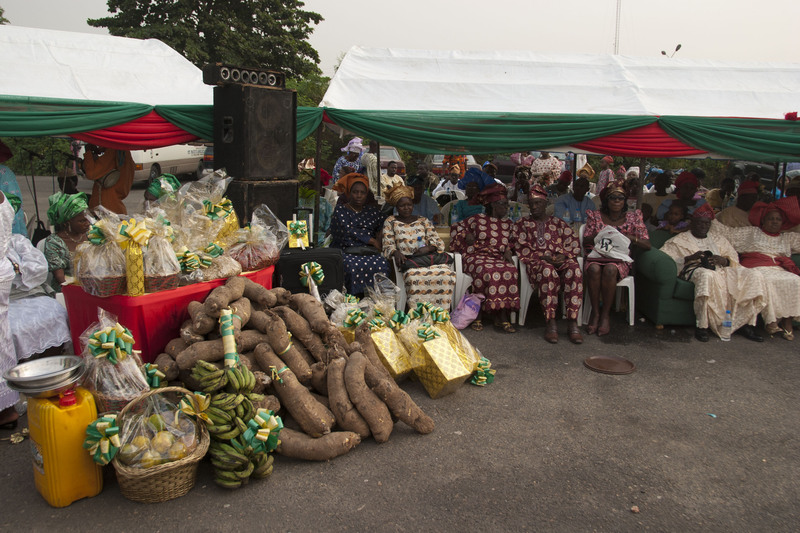 Food preparation is another part of the American Thanksgiving celebration that happens everyday in Nigeria. I can speak for Yoruba culture best when I say that Yoruba take a great deal of pride in their food. Making a meal is a serious job. From start to finish, one meal takes a lot of labor and time. The Yoruba woman also takes a lot of care in the way she prepares it. Pounding yam, making the stew, it is an art and Yoruba know the way they like it. This is one of the reasons you see Yoruba people abroad always seeking out African restaurants wherever they are. 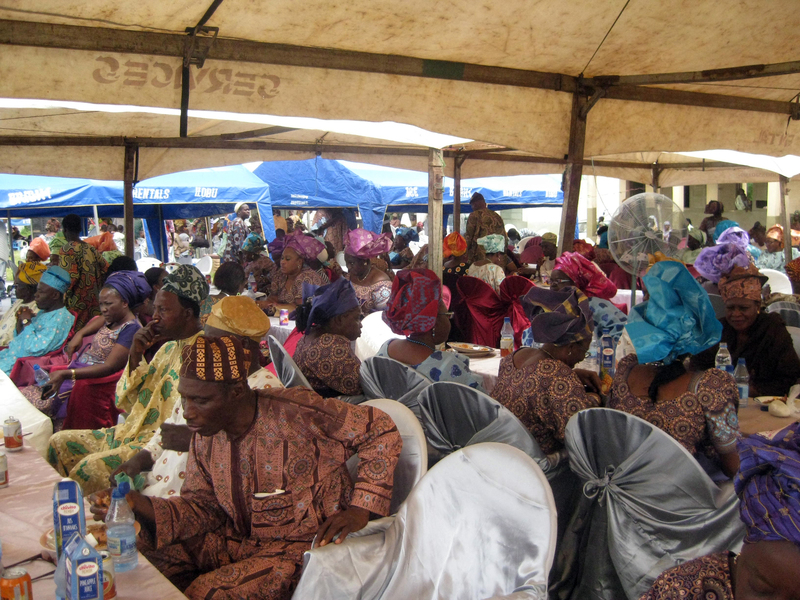 Of course there will be exceptions but it is safe to say that Yoruba people love their traditional meals so much. Celebrating American Thanksgiving is all well and good. I love the holiday myself because the food is always delicious and the company is even better. But being here and reflecting on what the word thanksgiving means in America and Nigeria is extremely eye opening. I wouldn’t trade one for the other, but I will combine the two into my own meaning of thanksgiving.